Drive to the front gate and tell the guard you are attending a meeting at Barat House. He will direct you to parking. River River visits Westchester! Enjoy some afternoon writing time at Barat House, the home and heart of the Manhattanville College MFA Program. We'll share a writing prompt and then serenade each other's literary souls with fresh-off-the-page readings. Join us anytime for this series of generative writing sessions. Donna Lee Miele writes fiction and nonfiction, teaches for Writopia Lab in Rockland and Westchester Counties, New York, and is an owner-manager of Cuppa Pulp Writers’ Space in Nanuet, New York. 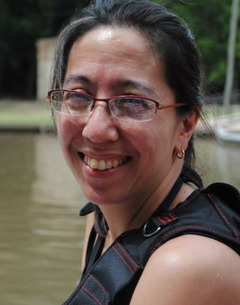 She is a founding editor of the literary journal River River (RiverRiver.org). Her fiction has been published in Red Fez, Atticus Review, and MendaCity Review. She received her MFA in 2014 from Manhattanville College. A. Anupama (Anu) is a poet, critic, essayist, and translator whose work has appeared in Fourteen Hills, CutBank, Numéro Cinq, Tulane Review, and elsewhere. She studied at Northwestern University and Vermont College of Fine Arts, where she received her MFA in writing. She organizes literary community and is a founding editor of the literary journal River River (RiverRiver.org). She currently teaches in creative writing workshops for kids and teens at Writopia Lab, and lives with her family in Nyack, New York. More about her work at Seranam.com.